Packer is launching a new range of great value kraft paper dispensers. Offering quick and easy dispensing, these new units boast a strong structure that easily supports a full roll weight. 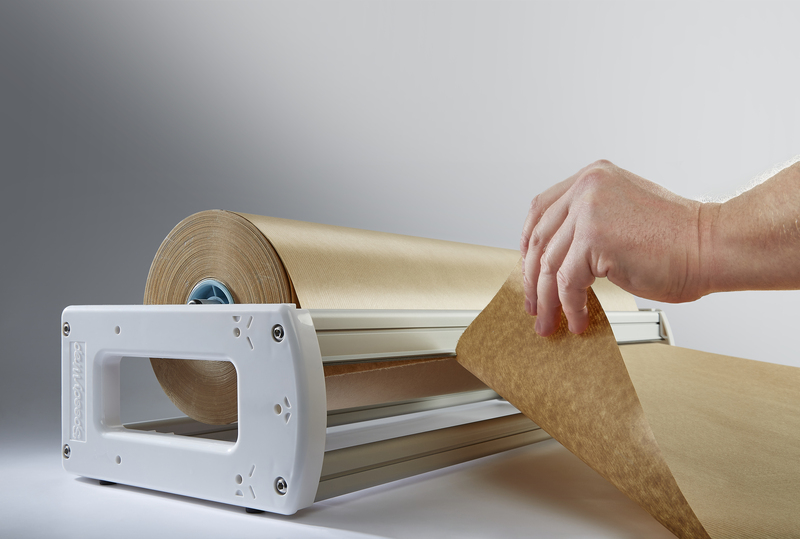 All models are fitted with a serrated blade for cutting kraft paper quickly and easily, and are available from just £32.70 for the smallest dispenser. Four different units are available from Packer to accommodate different roll widths up to 300mm, 600mm, 800mm and 1000mm, with a maximum roll diameter of 180mm. Strong feet stabilise the kraft paper dispensers to protect work surfaces while in use. Not only this, but each unit is designed with a sloping track that keeps the paper pressed against the front roller to stop it over-running, ensuring controlled dispensing and reduced waste. Adaptable and easy to adjust, Packer’s kraft paper dispensers can be set up a number of different ways and are easily assembled to suit different users’ preferences. The unit can be adapted to suit diverse work environments by being wall-mounted, left free-standing on a work surface, or being tucked away underneath a bench to save space. Packer also stocks a range of counter roll holders for dispensing kraft paper, which are designed with metal end plates for heavy-duty use. As well as being suitable for wall mounting and hanging under counters, these models can be stacked one on top of the other using special brackets. Counter roll holders are also available in four widths, covering 500mm, 600mm, 800mm and 1000mm. Don’t forget, Packer has a selection of kraft paper available to use alongside these dispensers. With three roll sizes on offer, all our kraft is strong, burst resistant, and approved for mailed products. All items are now available to buy at www.packer.co.uk.